Many astrology websites are so full of new age style sweetness and light that it’s sometimes hard to see the connection with the real world that most of us are stuck in. Whilst recognising the importance of always offering a positive viewpoint in birthchart interpretation to help people deal with their planets, Capricorn Research will not shirk from portraying a realistic view of life as it is. The coverage of the recent Grand Cross is a case in point, with many astrologers giving the impression that this would be an interesting opportunity to explore our inner resources and neglecting to mention the fact that it has caused serious damage in many people’s lives. Capricorn Research has been inundated with despairing questions from clients who have felt suicidal during this time and their plight would have been made much worse by some vague New Age woolliness in response. Astrology is not just for faint hearted space cadets and it is for this reason that another chart of a gruesome child murderer is to be depicted in this article. 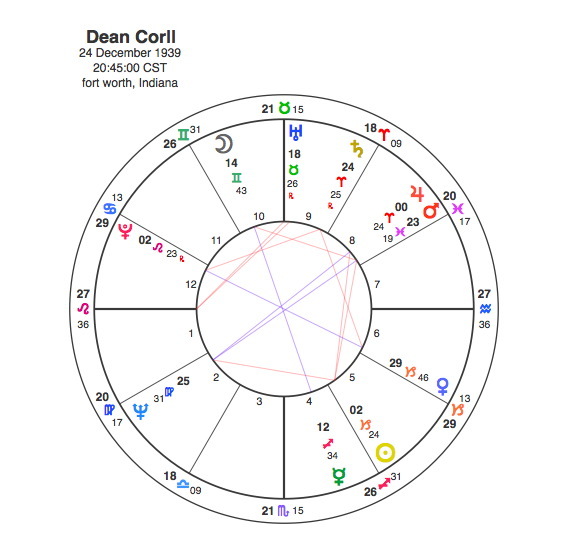 The determination to examine this chart is not deflected in the slightest by the fact that the person concerned shares a sun sign with the author. One of the problems when dealing with an astrological website based on the transits of Pluto is that there are times when you have to truly face the very worst manifestations of human behaviour, the lowest of all low life. If anyone struggles with this use of Astrology, the best advice is like that for people not wanting to know the football score before TV’s Match of the Day – look away now. There are after all plenty of alternative approaches to consider. Dean Corll was an American mass murderer who raped, tortured and killed at least 28 teenage boys. A striking thing about his chart is that it has 2 very difficult T Squares. It really doesn’t bear thinking about but any astrologer looking at the chart of a murderer would look first at the 8th house of death. Children are ruled by the 5th house. So for a child murderer, we would expect there to be a very difficult square between planets in the 5th and 8th houses. Mars is in the 8th house as part of a T Square that focuses onto an apex Sun in the 5th house. Mars is in Pisces in opposition to Neptune, a combination that you wouldn’t particularly expect in the chart of a serial killer. This could be explained by the fact that his targets were all innocent young boys. Mars’ conjunction with Jupiter is also not what you would expect but Jupiter is the planet of expansion, it enlarges whatever it touches. So Jupiter in this T Square in the 8th house, it simply means that Corll murdered a lot of young boys. The Sun in Capricorn can be hard and unfeeling, particularly when on the receiving end of tough aspects. But this T Square seems to be saying more about Corll’s targets. The other T Square signifies the brutality as Venus the planet that would normally point to one’s capacity to attract pleasant experiences is in the hard sign of Capricorn. Venus is opposite Pluto and this T Square focuses onto Saturn. So two such T Squares focusing onto Saturn and a Capricorn Sun shows someone with no natural human warmth at all. This is a bleak combination which creates an individual that can only produce suffering. When would all this occur ? Dean Corll had been steadily working up to it, but his killing spree actually started in 1970 and came to and end in 1973 when he was shot by Wayne Henley, one of his accomplices. Pluto was in Corll’s T Square from 1970 to 73, conjunct Neptune in 1970 and finally square to the Sun in 1973. There is really very little one can say in the face of such appalling depravity, but there is one small consolation in the fact that astrology can explain it. As you say, Jupiter magnifies what it touches, and it is in the 8th house and rules both the 8th and the 5th houses, which would also seem relevant to this ghastly case.